Train free your first week! The most progressive and dynamic self defense curriculum you will find. The way Krav Maga was meant to be. Out of shape? Never thrown a punch before? No problem. While all classes are appropriate for first-timers, this 30-minute class is built specifically for beginners. Violent encounters do sometimes make their way to the ground. Krav Maga - Ground Fighting is a class that specializes on learning how to deal with the realities of ground-fighting while making getting back to your feet a priority. A new vibe specifically developed for fighters and martial artists, without the “traditional” yoga experience. Fast paced, back to the basics. Heavy focus on shoulders and hips, loosening and warming the body before fight training. Focusing on opening and increasing flexibility and mobility of the hips and shoulders. Key elements in a good fighter. Heavy in strength training, and conditioning of the yin muscles. Yin muscles are the small muscles throughout the body that support our yang muscles (quads, abs, traps, deltoids). A slowed down practice. Holding postures for longer, and exploring asana in depth. Brazilian jiu-jitsu is a martial art and combat sport system that focuses on grappling and ground fighting. Our BJJ program has self defense and competition elements and is overseen by Nova Uniao 4rd Degree Black Belt Professor Marcelo Melerio. Muay Thai Fundamentals will focus on proper Muay Thai techniques. 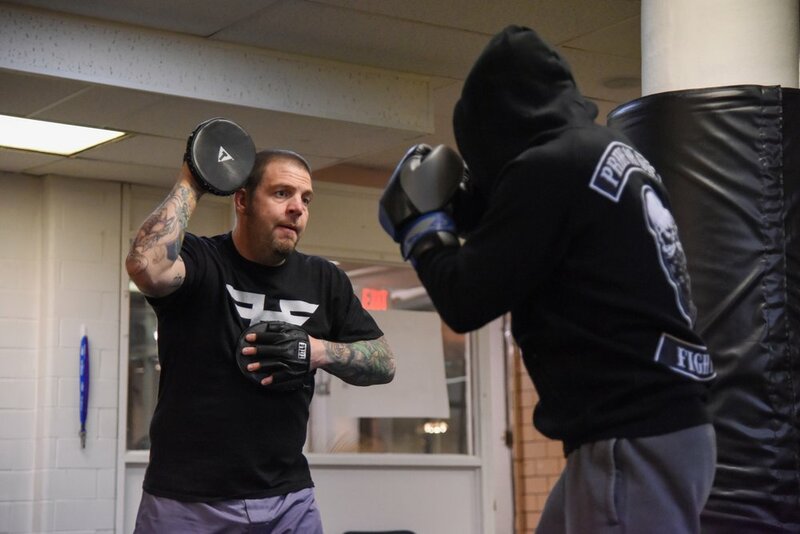 Each class will focus on one or more if the following: basics of specific strikes, proper guard, footwork, breathing, and combinations while also focusing on conditioning through pad work. The Muay Thai Novice class will expand on techniques from the fundamentals class. Through a combination of light contact drills and pad work we will work on strike combinations, defense, counters, and follow up strikes all while improving our overall conditioning. Students learn to work with partners, starting in clinch range, using Muay Thai and wrestling, while progressing to boxing and kickboxing ranges, as skill sets are enhanced and comfort with contact is reached. This sparring class is designed for any adult looking to get in great shape while learning valuable skills in a safe and fun environment. Come spend a fast-paced hour working with a partner working your striking, footwork, head movement, etc., but with a focus on breaking a sweat and burning some calories. No experience necessary! Boxing gloves are required for members. Leave the treadmills to the hamsters, you'll find real fitness solutions at Rough Hands! The class is a 30-minute, circuit-based, high-intensity workout that will transform your body from average to awesome and do it faster than you ever thought possible. Faster, stronger, leaner, more energetic, and healthier than ever before! Rough Hands Kids integrates, in a very unique way, the world’s most effective Martial Arts styles into a “Total Self-Defense” hybrid system. We link the elements of self-defense, striking , grappling and fitness; Integrating the energy of the workouts values with the character, discipline and confidence building your child needs to become a total package of success.